I have another card for you using the Happy Birthday Gorgeous set. This card was CASED from Marcy Denning on a Facebook group I am on. I couldn’t find a blog for her sorry. Berry Burst and Lemon Lime Twist are such a lovely combination aren’t they? For this card; stamp some outline flowers in Berry Burst diagonally across the white card mat, then stamp the solid flower in Powder Pink. Add some Lemon Lime Twist leaves to some of the flowers. Adhere this to a Berry Burst card mat and then a Thick Whisper White Card base. The sentiment from the Happy Birthday Gorgeous set is stamped and then cut with the Stitched Circle Framelits using Black Stazon. Then give a little wash over the sentiment with the Aquapainter and some Powder Pink ink. Cut a Scallop Circle with a Layering Circles Framelits in Berry Burst and adhere this behind the Stamped circle. For my card I added some loops of Silver Thread to the back of the circle before adhering it to the card with Dimensionals. I hope your weekend has been great?? I have been at a Craft Show all weekend and had lots of fun talking to people about stamping and making a card with some of them. Hope you have had some crafty time yourself. CAROLS OF CHRISTMAS – DAY 3! This card was inspired by a card I saw on Pinterest using a different Christmas set. I like the idea of the “negative” cut trees. Check this out!!! The Designer Series Paper is from the Delightful Daisy DSP. It’s not even a Christmas paper! It looks like falling snow though doesn’t it. 🙂 The other trees are cut from the Dazzling Diamonds Glimmer Paper. The sentiment on this card is from the Holly, Berry Happiness set. Such a nice sentiment. It is stamped in Smoky Slate. Sometimes I like stamping in the grey. It is just a little softer. I recently took part in a card swap with Demonstrators around Australia. There were several groups. I thought I would share the card swaps I received. This was for the RAK card swap (Random Acts of Kindness Facebook group). Firstly, this is the card I created. This was a card I made several weeks ago using the Eastern Palace Suite so I thought that I would make these. You can see the post for this card HERE. So these are the cards I received in return. Aren’t they great?? 🙂 Perhaps these might inspire you in one of your creating endeavours. This card I am sharing today was my first play with the Oh! So Eclectic set last week. I finally get to share it with you. I have used Stylized Birthday with it for the sentiment. I really don’t use this sentiment enough. It’s a great size without being overwhelming and I love the font. The detailed flowers were first stamped with Berry Burst and then the solid image with Powder Pink. Isn’t the washed out look nice? The leaves are stamped with Lemon Lime Twist for the solid leaf and then Emerald Envy for the “hatched” leaf pattern. I added some of the little “crossed” pattern in Powder Pink as a background filler. It’s a very quick card to make a number of Birthday cards in a hurry. Thanks for looking. I will be back with some more cards with this set. Catalogues, Product Share, Stampin' Up! LIKE THE NEW INCOLORS? WHY NOT GRAB A SHARE IN THE RIBBON! Have you seen the gorgeous new Ribbon on page 198/199 of the catalogue? So many different types and colours this year. Yet a whole roll can be too much. Why not grab a share! I have a share running for the 2017 Incolor Finely Woven Ribbon. 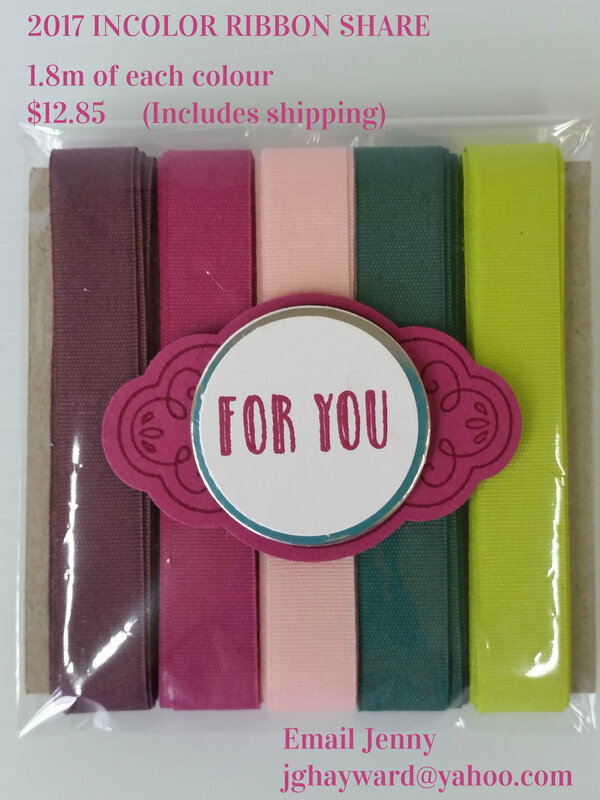 I am loving the new colours and having matching ribbon for your projects just takes it to the next level. For the price of a roll of ribbon you get 1.8m of each colour of Fresh Fig, Berry Burst, Powder Pink, Tranquil Tide and Lemon Lime Twist. Total is $12.85 includes Shipping and Handling. Free postage to send it on to you. Australian residents only. Why not grab a share – or 2. Let me know ASAP. LEMON LIME LABEL ME PRETTY! I needed to make some cards using the new Label Me Pretty Bundle. Now when I get a new stamp set I do a little searching online for samples using sets that are very similar. So in this case I was looking at the old Chalk Talk set and a few “tags” type sets. I couldn’t believe how many stamp sets that Stampin’ Up! have released with the word “tags” in the name. Anyway, I came across a few older cards that inspired me through Google searches and on Splitcoaststampers. This was the finished card I created. I stamped one of the “label” sideways on white card to create a flourish effect in Lemon Lime. The strip was adhered to the card and then I tied around some Thick Black Baker’s Twine. This was adhered to the Lemon Lime base card. Another label was stamped in Berry Burst on to the Berry Burst card and punched out with the Pretty Label Punch. The sentiment is stamped in black on to white card and cut with a Layering Circles Framelit. They were both raised up off the card with Dimensionals. I added some Rhinestones to the card but still felt it was a bit plain so after a day of looking at it I very nervously stamped some leaves from the Colorful Seasons set. I was so worried of messing it all up and getting ink everywhere at this point BUT it worked!! Phew! I think it might have been good to sponge the edge of the card with Lemon Lime ink but I wasn’t going to bother with that at this point. So a simple card but funny that the whole card was designed around this little strip of paper! I have a little housekeeping to take care of today. Just a few reminders to keep you up to date with what is happening. Open House this weekend. Please RSVP. Extra Rewards with qualifying parties. ** Just a reminder that if you receive these posts by email please be sure to click on the SHOW IMAGES tab at the top to read the images. It’s on this weekend. I have been busy making samples and getting things ready. If you plan on coming please let me know by tomorrow (Wednesday) to be sure of a seat. Whether the orders are directly to me by email or at my Open House, or through my Online store all are eligible. ** Orders will close at 6pm on Sunday 11th June. ** If orders don’t reach the minimum of $250 for Host Rewards the winner will still receive a Free Gift of your choice to the value of $20. Has it been a while since you have got together with friends and stamped with me? What better time than now with the new Catalogue out and with extra rewards this month from Stampin’ Up! Receive an additional $45 with a qualifying order of $450. What will you spend with that much? In addition, all hosts will receive an exclusive Host Voucher Book with vouchers to redeem in the next 6 months. Get your diary and give me a ring. Have you had a chance to see the catalogue yet?? You can now view it online HERE. If you would like your own copy to look through and add your post-it notes too then drop me a comment and I will get one out to you ASAP.